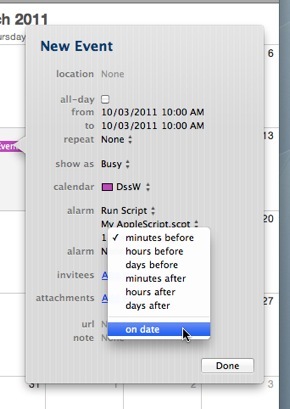 You can use Mac OS X's iCal to automatically run an AppleScript on a particular date and time. You can use this ability to send e-mails, interact with applications, and perform tasks without needing anybody around to oversee the work. 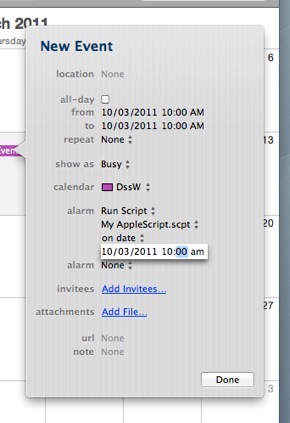 Let's ask iCal to run an AppleScript on 10 March 2011 at 10:00 am. Navigate to the month of March. 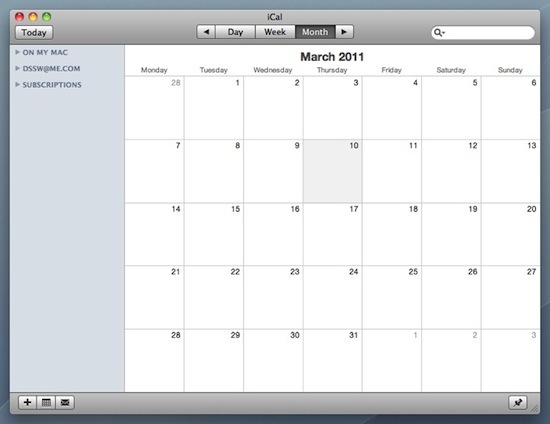 Click on the 10th March to select the day. Change the from and to dates to 10:00 am. Click on the None next to the alarm label. Select Run Script from the alarm menu. 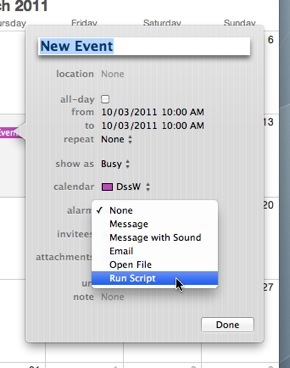 An open dialog will appear; select the AppleScript to run. 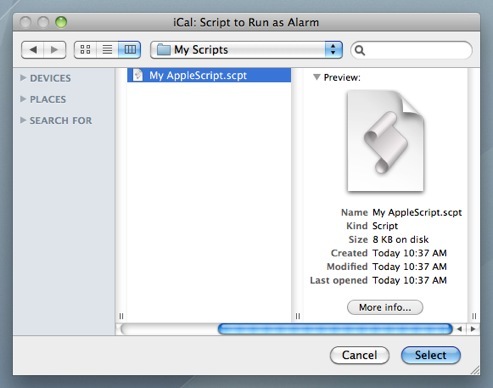 Once an AppleScript is selected, two new items will appear next to the alarm label: (name of the AppleScript) and 15 minutes before. Click on the 15 minutes before, a little below the alarm label. Select on date from the menu. 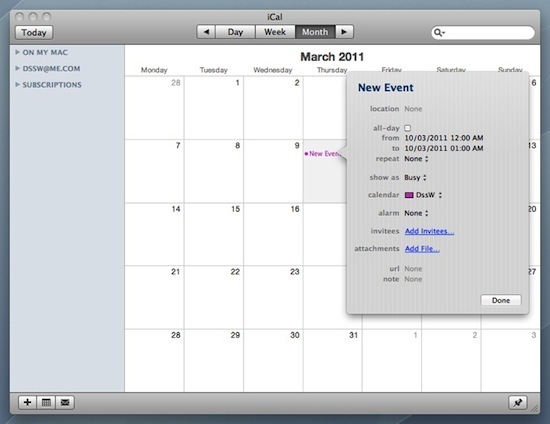 A new date and time control will now appear. Change this date and time control to 10:00 am. Click Done to finish editing the event. Your new event is now scheduled. You must be logged in for the AppleScript to run. 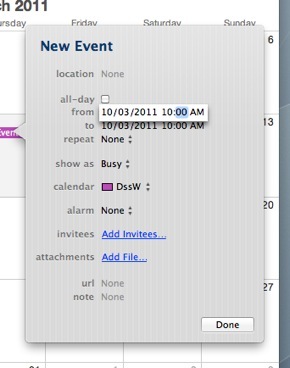 Your Mac must be powered on and awake when the event is due. 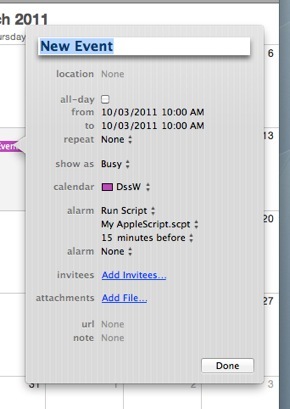 This article was posted in AppleScript, and Recipe and tagged AppleScript, iCal, and schedule.